We became interested in the antibiotic malonomycin because it has a highly unusual chemical structure, and possesses potentially useful antimicrobial activity that had attracted industrial attention. Malonomycin is produced by the bacterium Streptomyces rimosus, and is the only bacterial natural product that we are aware of which possesses an intact malonic acid moiety. Malonates are common intermediates in the biosynthetic pathways to fatty acids, polyketides and other metabolites. However, it is highly unusual to find an intact malonic acid group in the final product. One example of a malonic acid-containing metabolite is γ-carboxyglutamate (Gla) which is found in mammalian cells. Gla arises through the action of the vitamin K dependent carboxylase (VKDC) enzyme. 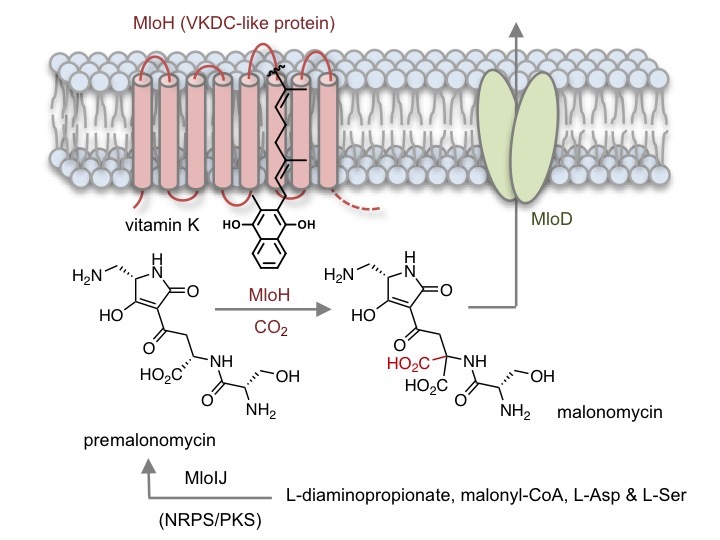 It is suggested that the VKDC deprotonates and oxidizes the vitamin K co-factor, to generate a strong base that abstracts a proton from the side chains of glutamate residues of VKD protein substrates, facilitating subsequent carboxylation. The resulting Gla residues of the VKD protein products coordinate calcium ions, triggering many essential physiological responses including blood coagulation. Several therapeutically important anticoagulants, including warfarin, function by blocking the action of the VKDC. Whilst the mammalian VKDC was discovered over 40 years ago, and remains of medical importance, many details about the structure and mechanism of this enzyme are still unknown. In contrast to other classes of carboxylase enzymes that mediate different carboxylation reactions in multiple pathways, glutamate carboxylation is the only reaction that has been shown to be catalysed by a VKDC enzyme. At the outset of the project, we knew very little about the biosynthesis of malonomycin. Therefore we sequenced the genome of the malonomycin producer, S. rimosus, and identified a candidate cluster of genes that we predicted was required for malonomycin biosynthesis. Within this cluster were genes encoding nonribosomal peptide synthetase (NRPS) and polyketide synthase (PKS) modules that assemble amino acid and malonic acid precursors. Surprisingly, we also found a gene that encoded a putative integral membrane protein (MloH) which was similar in sequence to the mammalian VKDC. Using a combination of bioinformatics, CRISPR-Cas9 mediated gene deletions, complementation and in vitro experiments we were able to establish a biosynthetic pathway to malonomycin. The NRPS/PKS assembly line condenses serine, aspartate, malonate and diaminopropionate to generate the intermediate premalonomycin. Using 18O-labelling experiments we showed that the aspartate precursor was activated via the side-chain (C4) carboxyl group, rather than the typical C1-carboxyl group. Premalonomycin is then carboxylated by the VKDC-like enzyme MloH generating the malonic acid moiety of malonomycin, which is essential for its biological activity. Interestingly, many other VKDC-like enzymes of unknown function are present in bacteria and other domains of life. We showed that one such VKDC-like enzyme, from a Norcadia bacterium, also possesses carboxylase activity similar to MloH. We are optimistic that our study might open the way to the discovery of other novel VKDC-like enzymes, pathways and possibly new antibiotics. This research has now been published in Nature Catalysis.